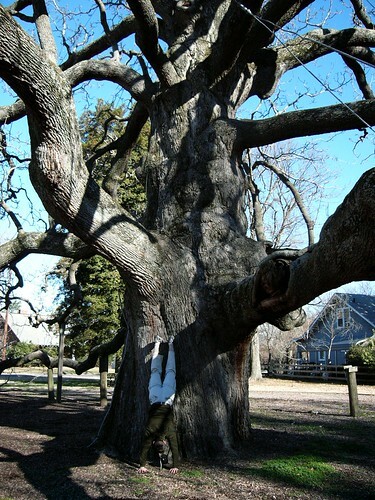 Inspired by a similar blog post about 10 Magnificent trees that has been widely propagated around the blogsphere I decided to put together my own list of great trees of renown that I believe is more accurate than the above mentioned post. I had a hard time keeping the list to ten and ended up expanding it to twelve with some runner-up trees by category. At the end of the post I also mention some more truly great trees that did not make the list. General Sherman, originally uploaded by blueph0enix. The General Sherman Tree is the largest tree by volume in the world and one of the fastest growing. It belongs to the species Sequoiadendron giganteum. Coastal Redwood Portrait, originally uploaded by KbH. The Coastal Redwood (Sequoia Sempervirens) is the tallest tree species in the world. 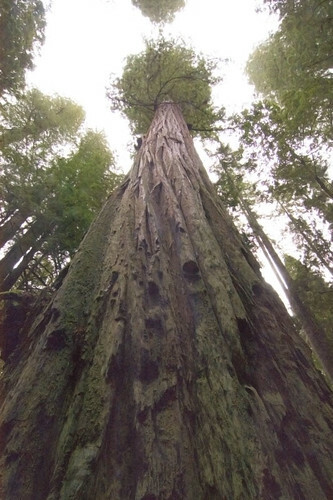 The tallest actual tree is the Hyperion tree which stands at 379 feet tall. Another Tall Coastal Redwood is the Stratosphere Giant at 112 meters. Great banyan tree, originally uploaded by YamezA. 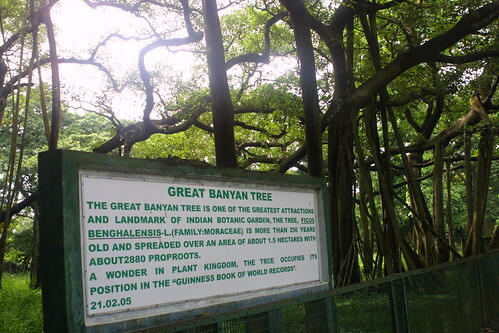 "The Great Banyan Tree is one of the greatest attractions and landmark of Indian Botanic Garden. The tree, Ficus Benghalensis-L. (family Moraceae) is more than 250 years old and spreaded over an area of about 1.5 hectares with about 2880 proproots. 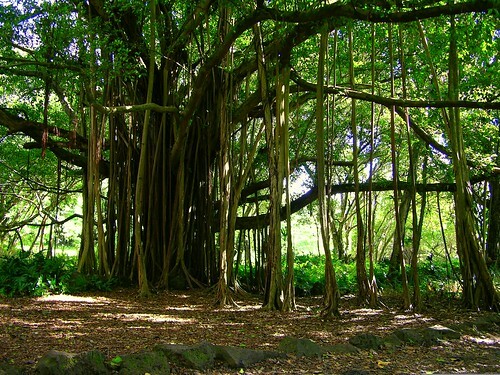 A wonder in the plant kingdom, the tree occupies its possition in the "Guinness Book of World Records" 21.02.05"
The Great Banyan Tree, originally uploaded by Joe Gratz. Although the main trunk of the is tree was removed in 1925 it continues to grow outward and has spread past the fence that was built around it. The highest branch is 24.5 meters tall and the canopy extends over 420 meters in diameter. 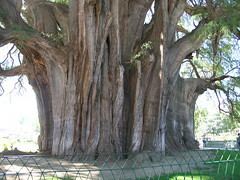 The "Arbol del Tule", a Montezuma cypress (Taxodium mucronatum), is claimed to be the tree with the largest diameter in the world. 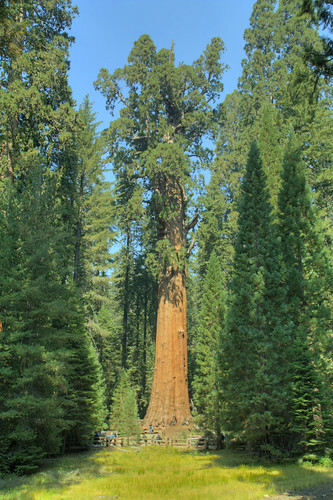 At 11.62 meters its diameter is greater than that of the largest Sequoia tree. The Tule tree is located in Oaxaca, Mexico and is claimed to locals to be the largest tree in the world (by volume and tonnage) although this claim is not scientifically proven. None the less it is a very impressive tree! "When baobabs become a thousand years old, they begin to hollow inside. In the Big Baobab this has resulted in wonderful caverns and caves, where the world famous Baobab Tree Bar and Wine Cellar now amaze visitors. The tree bar can accommodate more than 60 people!" 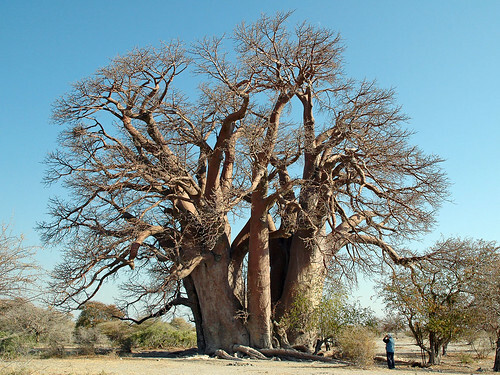 In Botswana´s Kalarari Desert near the Makgadikgadi Pans (once a very immense inland lake in Africa) is a very large tree that goes by the name “Chapman´s Baobab”. In was named by a South African explorer by the name of James Chapman in 1861 when he was on an expedition with his brother and Thomas Baines. This tree is about 25 meters in circumference at its base (Baobab trees swell with water when it rains which makes trunk measurements difficult as they very from season to season). From what I have found I think that this is the second largest Baobab after the “Sunland Baobab in Limpopo which has a circumference of 46.8 meters.The tree is reputed to be between 4,000 and 6,000 years old. 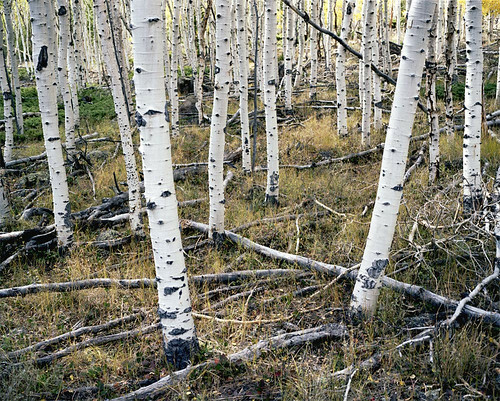 The Pando tree is a "clonal colony" which means that this whole grove is one living organism that sends up multiple "stems". Each of what we would consider one "tree" is just a part of this giant living organism. These individual "stems" sprout grow to maturity and eventually age and die and fall over but the organism that they are a part of lives on. The largest known clonal colony is this forest of quacking aspens in Colorado that is estimated to have 40,000 stems and to be as old as 80,000 years. Sri Maha Bodhi, Anuradhapura, originally uploaded by get down. A descendant of the tree under which Buddha is thought to have received his enlightenment. Most Resistant tree - "The Tree of Life"
The famous Tree of Life, originally uploaded by solvo. 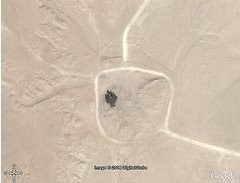 Out in the middle of a vast desert in Bahrain there stands a tree that is popularly called the "Tree of Life". It is a solitary splash of green in a vast ocean of sand. It is believed to be a 400 year old "Mesquite"(??) 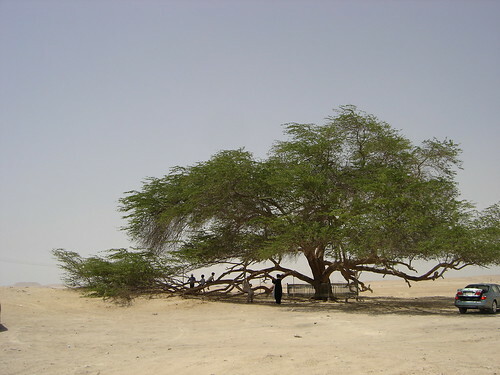 tree and is located about 2 kilometers from Jebel Dukhan. According to local legend this tree stands in the exact spot of the Biblical garden of eden. A cedar of Lebanon, originally uploaded by CharlesFred. 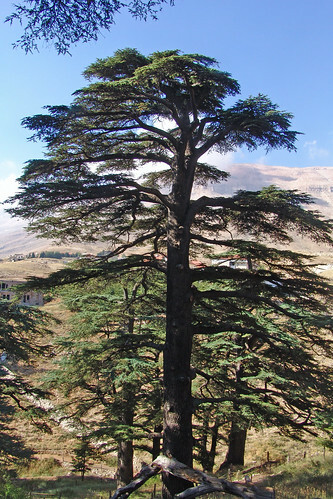 This large Lebanese cedar tree stands on Mount Lebanon and is a fine example of the tree that is the symbol and pride of the country. This tree species (Cedrus Libani) should not be confused however with what are commonly called “Cedar” trees in the United States. The Cedars of Lebanon have been trees of renown for thousands of years. The wood of this tree was used by Solomon in the construction of the temple that he built in Jerusalem. Important to many ancient civilizations such as the Babylonians, Egyptians, Hebrews, Arabs etc. The dragon tree at Icod, originally uploaded by 126 Club. I had the good fortune to be able to visit this increadible tree back in 1994. They say that this tree (Draceana draco) is over 1000 years old. It is located in the Canary Islands, on the Island of Tenerife in the town of Icod. 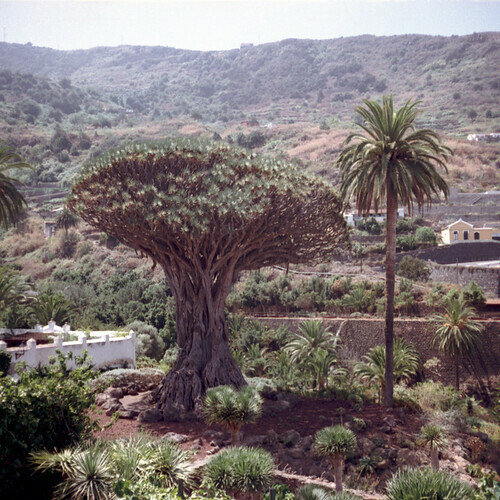 These Dragon trees (sometimes called Dragon's blood trees for the red color of their sap) grow wild only in the Canary Islands but have been planted in many other places such as California, Australia, Spain, etc. (in places where the temps don't go sub freezing). IMG_7091, originally uploaded by Jared Zimmerman. The Muir woods is a stand of ancient Sequoia trees located just north of San Fransisco in California. It is probably the Sequoia area that is closest to a major urban center. 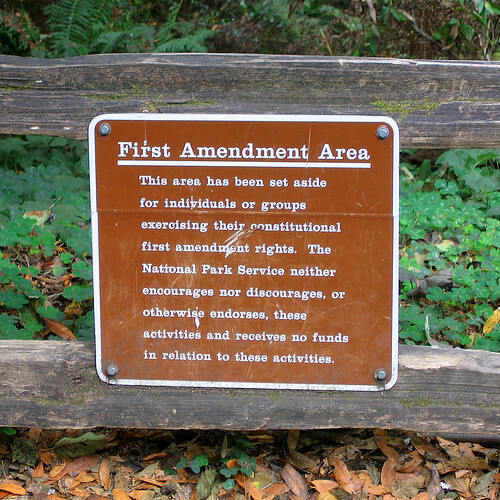 It is also a place were you can go to practice your "First Amendment" rights! I´ll bet you did not know that there were only select places such as this were you are free to practice your constitutional rights (as a US citizen that is). Hmm, I wonder who thought up this sign? 1st Amendment Over Here, originally uploaded by Lance McCord. Young and Old, originally uploaded by tomhe. Sequoia, originally uploaded by 4StringsGood. This Coastal Redwood tree was planted in 1859 and is more than 50 meters tall. It is located in the New Forest of Rhinefield. 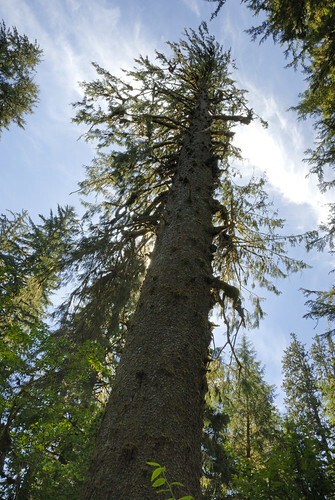 Big Sitka Spruce, originally uploaded by Robert Whitlock. The temperate rain forest is dominated by Sitka spruce, Except where it penetrates valleys such as the Hoh, the Sitka grows along a narrow coastal strip from northern California to Alaska. High rainfall, fog, and ocean-moderated temperatures create optimum growing conditions for these monarchs. 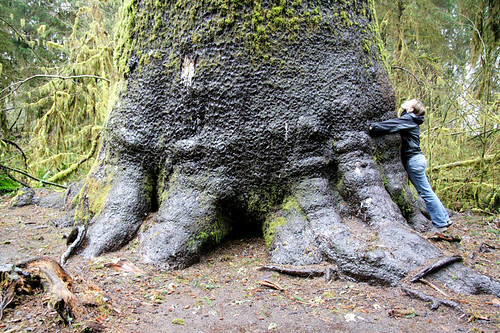 This is one of the largest Sitka spurce trees in the United States. At dawn and dust be alert for elk crossing the road. Eik Cedar., originally uploaded by gak. 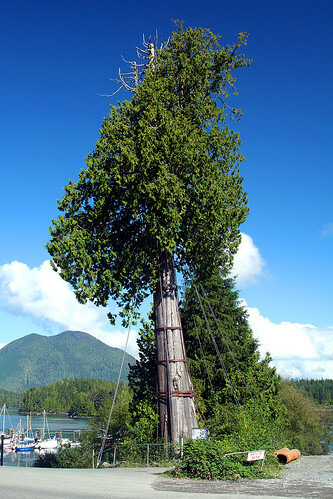 This 800 year old tree is a popular attraction in the small town of Tofino on the west side of Vancouver Island. Local residents and arborists have rigged a series of cables and supports to keep the tree standing. I´ve been unable to determine if this tree is a Western Red Cedar or a Port Orford Cedar. Morondava, originally uploaded by Rita Willaert. 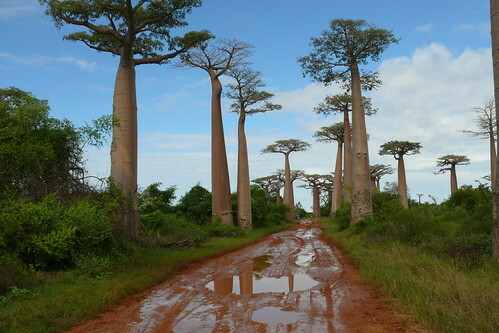 Grandidier's Baobab is one of only eight species of Baobabs in the world. Of these eight, six are found only in Madagascar, one in Africa and one in Australia. The Grandidier Baobab is the largest and tallest of the Madagascar Baobabs. Wat Mahatat, Ayutthaya, originally uploaded by Zimmelino. This tree is famous not in and of itself but rather for the Buddha's head that is rather firmly lodged in it's tangled roots. It is told that in 1767 the Burmese attacked and destroyed Ayatthuya. In the process they chopped of the heads of all of the Buddha statues. This particular head must have fallen among the prop roots of a bodhi tree. Over the centuries the roots have grown around the head in such a way that almost seems intentional. 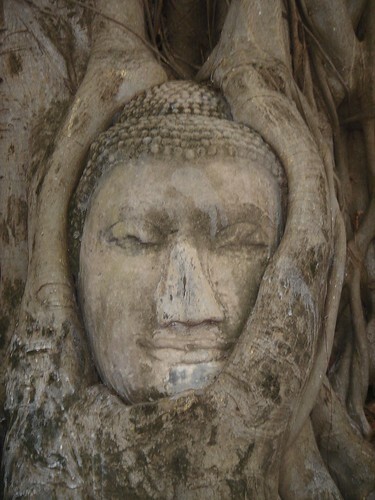 Buddha head in tree, Wat Mahatat, Ayutthaya, originally uploaded by dhess. Dave lending a sense of scale, originally uploaded by TATTERH00D. 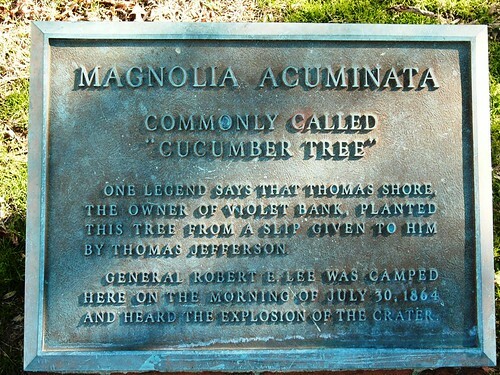 One legend says that Thomas Shore, the owner of violet bank, planted this tree from a slip given to him by Thomas Jefferson. General Robert E. Lee was camped here on the morning of July 30, 1864 and heard the explosion of the crater. The legend., originally uploaded by TATTERH00D. tree_of_tenere_1, originally uploaded by Alihodza. 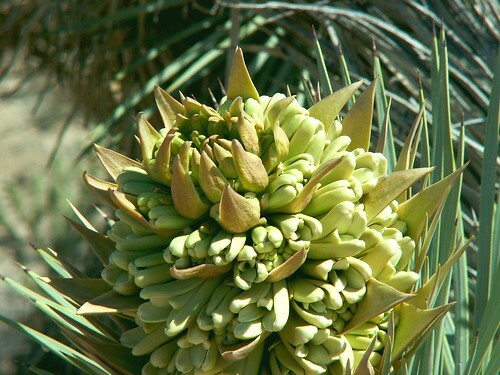 "The Tree of Ténéré, was a solitary acacia, of either Acacia raddiana or Acacia tortilus, that was once considered the most isolated tree on Earth — the only one within more than 400 km. It was a landmark on caravan routes through the Ténéré region of the Sahara in northeast Niger — so well known that it is the only tree to be shown on a map at a scale of 1:4,000,000...It was the last surviving tree of a group of trees that grew when the desert was less parched than it is today. The tree had stood alone for decades. During the winter of 1938–1939 a well was dug near the tree and it was found that the roots of the tree reached the water table 33–36 meters below the surface." CIMG0775.JPG, originally uploaded by alonzoD. An engraving at this tree reads…. CIMG0774.JPG, originally uploaded by alonzoD. This tree is located along the Freeman Creek Trail that cuts through Freeman Creek Grove. This grove is part of the Giant Sequoia National Monument in the Southern Sierra Nevada Mountians. 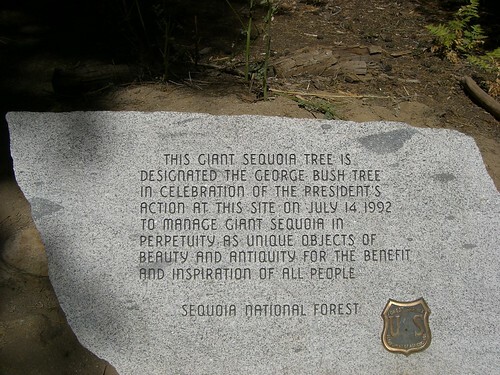 It is a wilderness area of Sequoia´s that have never been logged. 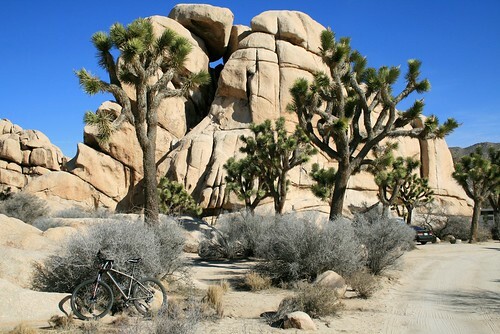 The area is popular with mountainbikers. The George Bush referred to here is George Herbert Walker Bush (b.1924) not George Walker Bush (b. 1946) the current president of the United States of America. 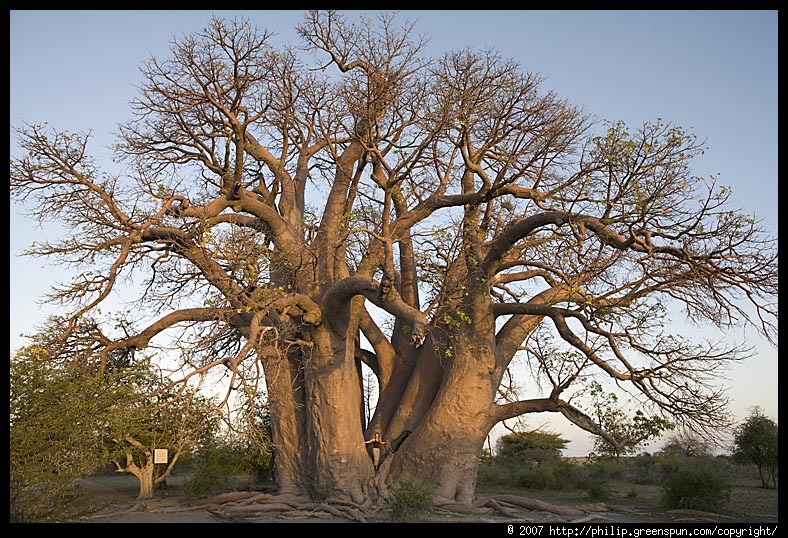 In Botswana´s Kalarari Desert near the Makgadikgadi Pans (once a very immense inland lake in Africa) is a very large tree that goes by the name “Chapman´s Baobab”. In was named by a South African explorer by the name of James Chapman in 1861 when he was on an expedition with his brother and Thomas Baines. This tree is about 25 meters in circumference at its base (Baobab trees swell with water when it rains which makes trunk measurements difficult as they very from season to season). 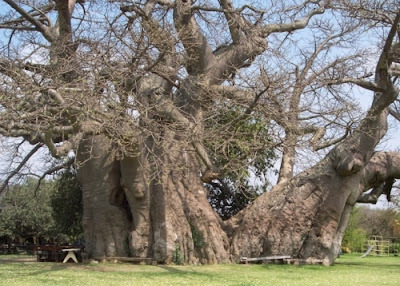 From what I have found I think that this is the second largest Baobab after the “Sunland Baobab in Limpopo which has a circumference of 46.8 meters. 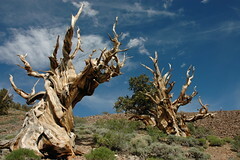 The tree is reputed to be between 4,000 and 6,000 years old. ch_20070823_01363, originally uploaded by chocoadicta. 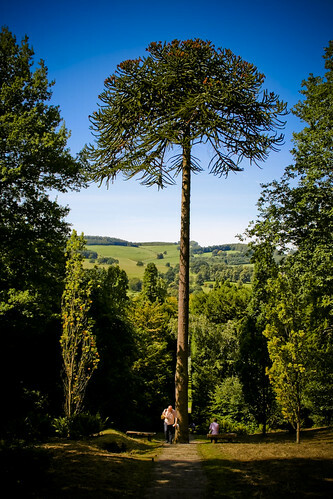 Located on the grounds of a large famouns English country house is a large Monkey Puzzle tree (Araucaria araucana). The estate, located in Derbyshire, is called Chatsworth House and is the home of the Duke and Duchess of Devonshire. One of this house´s many claims to fame is that it was used as “Pemberley” in the 2005 film version of Jane Austen´s Pride and Prejudice. This Monkey tree can be found along a path just east of the maze and west of Morton pond. Use the map as at this link to find this great tree. 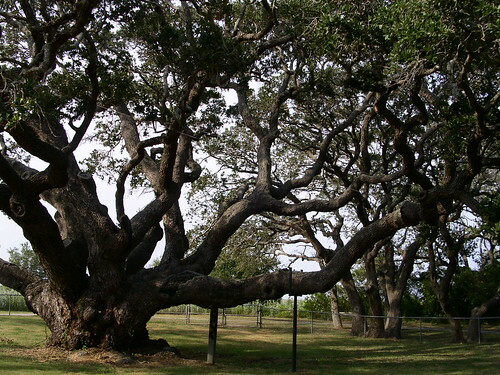 The "Big Tree" at Goose Island State Park was named the State Champion Coastal Live Oak (Quercus virginiana) in 1969, and is thought to be one of the largest in the nation. Twisty!, originally uploaded by g-hat. Outside of Phimai, Thailand's is one of the oldest and largest Banyan trees in Southeast Asia. 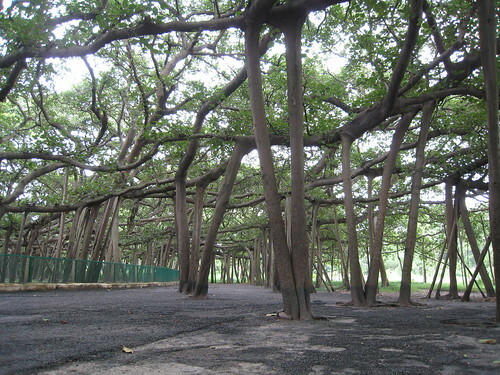 It is called "Sai Ngam" which means beautiful Banyan. 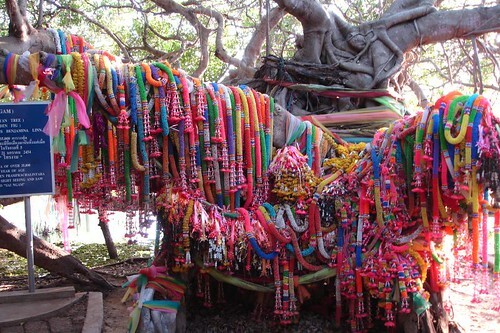 There are numerous fortune tellers and vendors that work in the tree as if it was a great bit covered market. You can purchase fish or eels to release in order to give you good fortune and prosperity. This sacred tree is one of the more popular attractions in the area. Blessed mangrove, originally uploaded by 10b travelling. Java Tree, originally uploaded by Undercover Nerd. Peradeniya, south east of Kandy, Sri Lanka. 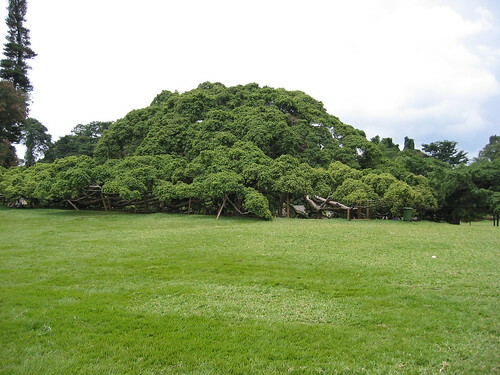 This is a large handsome tree indigenous to Malayasia and introcuded to Sri Lanka in 1861. The specimen here is over 100 years old and has spread over an area of about 2420 sq. meters. Enormous fig tree, Peradeniya Botanical Garden, Sri Lanka, originally uploaded by Paul Mannix. Maui - The Road to Hana - return journey, originally uploaded by Gypsy and The Fool. Nations Xmas Tree General Grant, originally uploaded by papa rotzi. 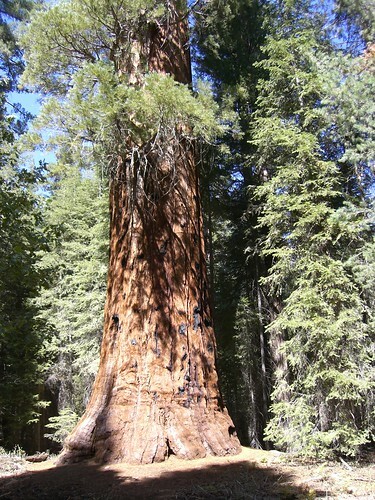 The General Grant tree is the third largest tree in the world and the second largest of the Giant Sequoias. In 1867 it was names after General Ulysses S. Grant who later became the 18th President of the United States. In 1962 US President Calvin Coolidge proclaimed this tree the “National Christmas Tree”. In 1956 US President Dwight D. Eisenhower gave the tree the designation of “National Shrine” as a memorial to all those lost in war.